It looks like T-Mobile may be getting a new QWERTY smartphone according to @evleaks, who claims the "UnCarrier" will be getting its hands on an LG Android device with a slide-out keyboard dubbed the Optimus F3Q. There's no word on the new handset's other specs or when it might launch. 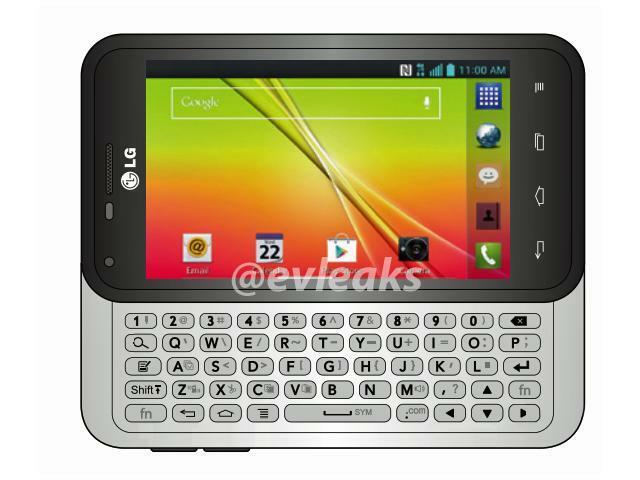 Based on what appears to be a leaked press render, though a rather low quality one, the LG Optimus F3Q appears to offer a metallic QWERTY keyboard with two buttons on the side, a front-facing camera. Back in August, T-Mobile got its hands on the mid-range Optimus F3, an all-touchscreen device with a 4-inch display, a dual-core processor, 2,460mAh battery, a rear 5-megapixel, and Android 4.1. We can only hope the new Q version offers improved specs over its under-powered brother. For BlackBerry fans looking to wean themselves off the struggling platform or QWERTY fans unsatisfied with the current selection of Android devices with physical keyboard, the Optimus F3Q could be a good choice. T-Mobile charged $0 down and $10 a month for 24 months for the Optimus F3 so it's possible we could see the same offer for the F3Q, though we'd rather pay a little more if it means getting a better phone.